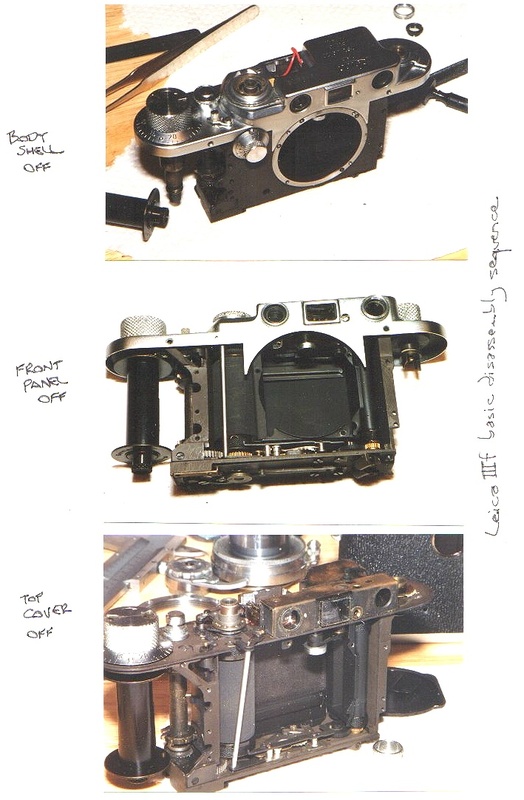 Here are the basic steps required to open up a Leica IIIC or IIIF for service. The shutter can be operated at all speeds with the outer shell off for shutter adjustment, which is an advantage over the earlier IIIa. Please note that although the functional features are very similar, the construction of the IIIa is different and so is the disassembly procedure. The front panel can be taken off either before or after removing the top. Sometimes you only need to go one place or the other, so you don't need to disassemble it all. The actual camera shown here is a IIIF without self timer. The IIIC is nearly identical, slightly simpler due to its lack of flash synch (prewar IIIC's are slightly different).